So last night we had a very special birthday. The number doesn’t matter (they’re getting too big to dwell over these days), but it did mean that we were looking for somewhere spectacular to celebrate. And somewhere we hadn’t been before. So we decided to pay a visit to the One & Only hotel in Cape Town’s Waterfront and try out Reuben’s. When the One & Only opened in Cape Town it soon became known by locals as the “One & Lonely” because apparently there was never anyone there. Too expensive, too stuffy, too exclusive were the reasons touted. It was time for us to see for ourselves. The setting is magnificent. And it seems like the hotel has been designed totally with the view in mind. The whole front is glass and looks up at the magnificence that is Table Mountain. Yes it certainly does have an air of opulence about it, nothing wrong with that. Reuben’s is the brainchild of South African chef Reuben Riffel. It seems that he grew up in a family of seriously good cooks, the sort of family where cooking and eating together is vital – gotta love that. He now has restaurants in Franschhoek, Paternoster and obviously at the One & Only. I have visited his establishment in Franschhoek but it was some years ago and BB (Before Blogging), so I can’t tell you much about it except I’m sure I enjoyed it. Anyway, enough said, let’s move on the our night at Reuben’s in the One & Only. On arrival we gasped at the stunning Table view as you walk in, looking across the bar and waterways, it’s unique and awe-inspiring. Reuben’s is down a flight of stairs. 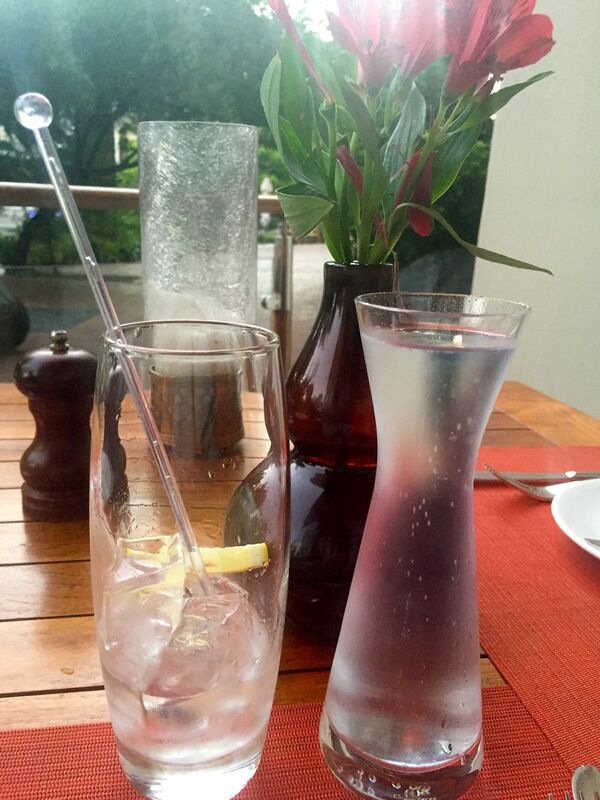 We were keen to have a pre-dinner drink and after being welcomed warmly we were led out onto the terrace and served perfect gin and tonics. Then it was time to move inside and get down to the serious business of ordering. This is one of the hardest menu choices I’ve ever had to make! It’s so comprehensive and wide-ranging. While we were grappling with our decisions we ordered a bottle of wine. The sommelier came back to our table and informed us with regret that the wine we’d ordered was sold out. We chose a second and that too was gone. It’s a particularly busy time in Cape Town at the moment with the big Mining Indaba on and the State of the Nation Address and opening of Parliament happening. Still, not great. Made immediately fine by the offer of two glasses of sparkling wine on the house while we decided on our third wine choice. Can’t say no to free bubbles, can you? And then as it happened, the charming sommelier managed to find a bottle of our first choice, anyway. Happiness all round. Our waiter assisted with our menu-grappling and highly recommended the Table Toppers (a reference to the aforementioned mountain perhaps?). 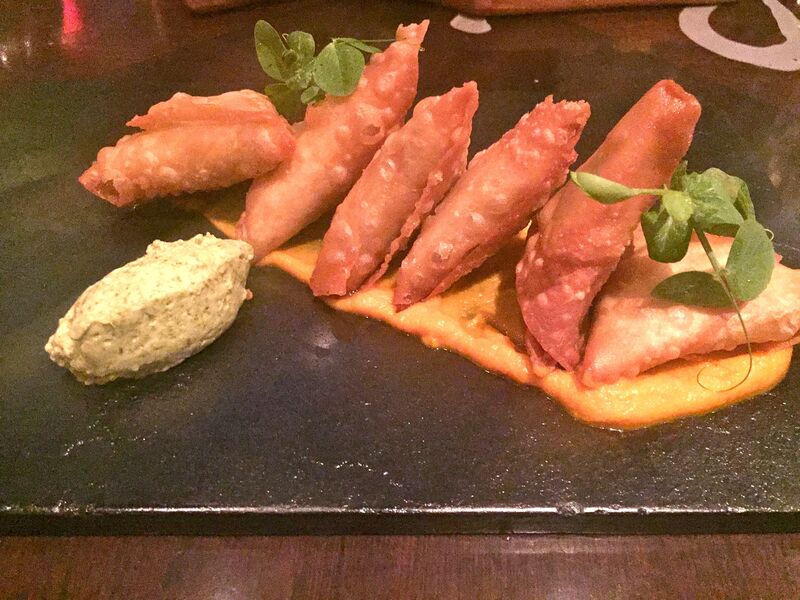 It says on the menu that they are designed for sharing but he said that they would work equally well as starters. So that’s what we did. Two Table Topper starters coming up. 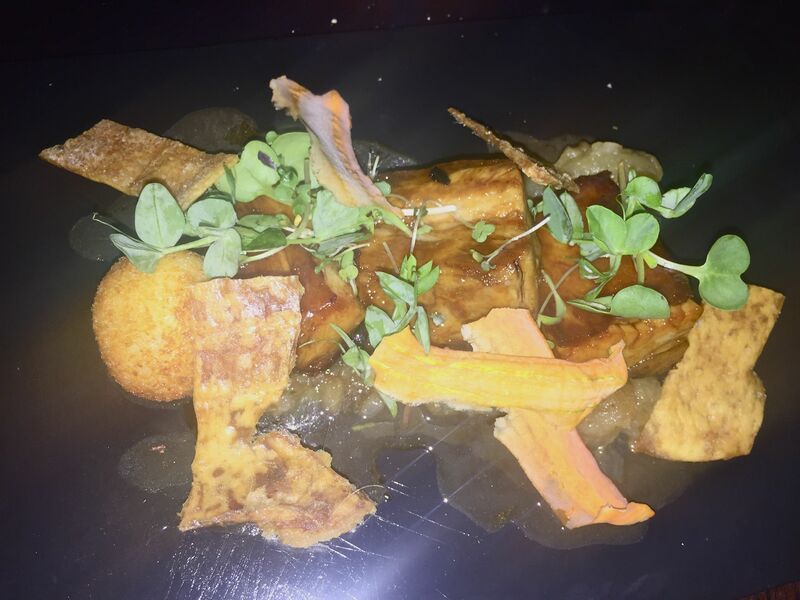 Keeping with my pork belly summer I ordered the house smoked pork belly with apple and sultana chutney, ham croquette and pork crackling. It was amazing, if rather large – this is more like a main course for me! I loved the combination of textures and the little slivers of apple were a genius touch. The birthday boy went for another Table Topper – the lamb bobotie samoosas served with coriander and curd raita and carrot royale. Filled with luscious lamb mince, the pastry was light and delicate and perfectly crunchy. Loved the carrot royale too. Okay, so we do eat out a lot, but that’s not to say we eat a lot – seriously, we really don’t. These were two large starters and we asked if we could take the leftover samoosas home with us (two of them) – they were that good! No problem at all. It was one of those nights that nothing was a problem. Even better, when we were presented with our doggie bag (a logoed One & Only doggie bag…just saying), our waiter told us he’d added extra samoosas as we’d seemed to like them so much. Another full portion of the tasty babies! That’s dinner tonight sorted! I was so impressed with this gesture. On to the mains. 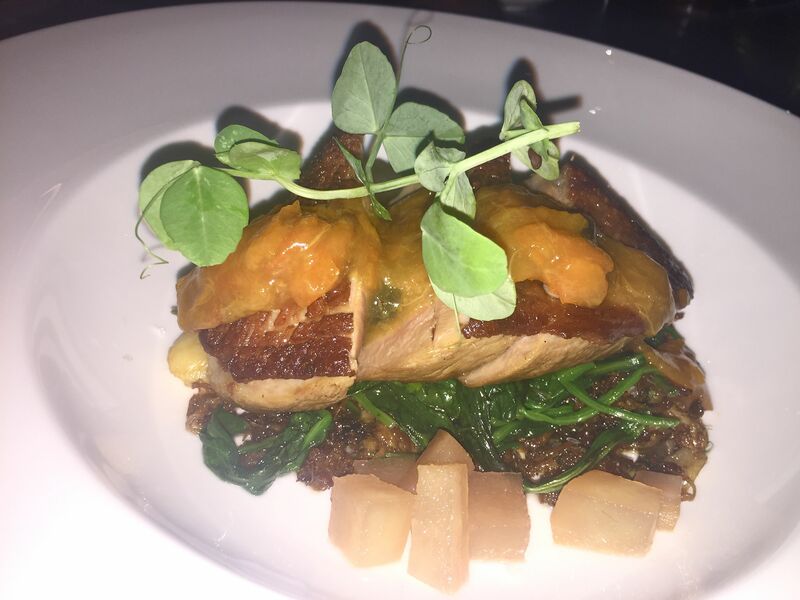 I ordered the corned duck breast which came with wilted baby spinach, leg meat hash and kumquat mayonnaise. A large, flavoursome duck breast topped the rest of the goodies. And right at the bottom, peeking out, was the stunning leg meat hash. I could eat a whole bowl of it on its own. Yummy! 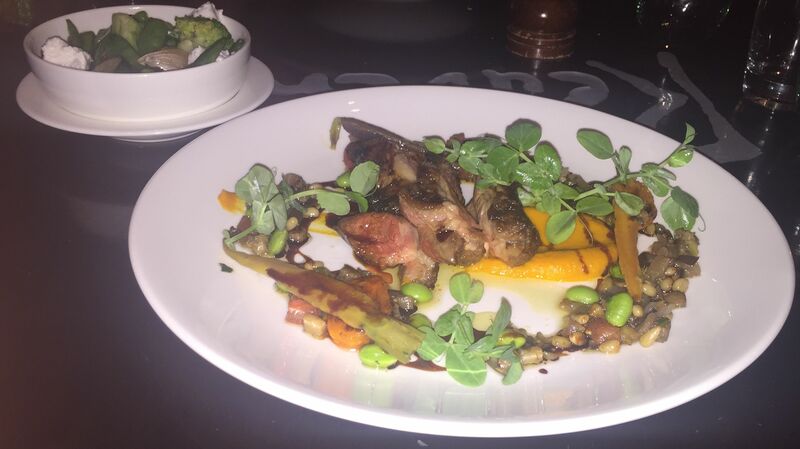 The pan-roasted Karoo lamb rump came with heirloom carrots, rustic caponata and more of that sweetly tasty carrot royale. A real picture on the plate and great flavours, too. 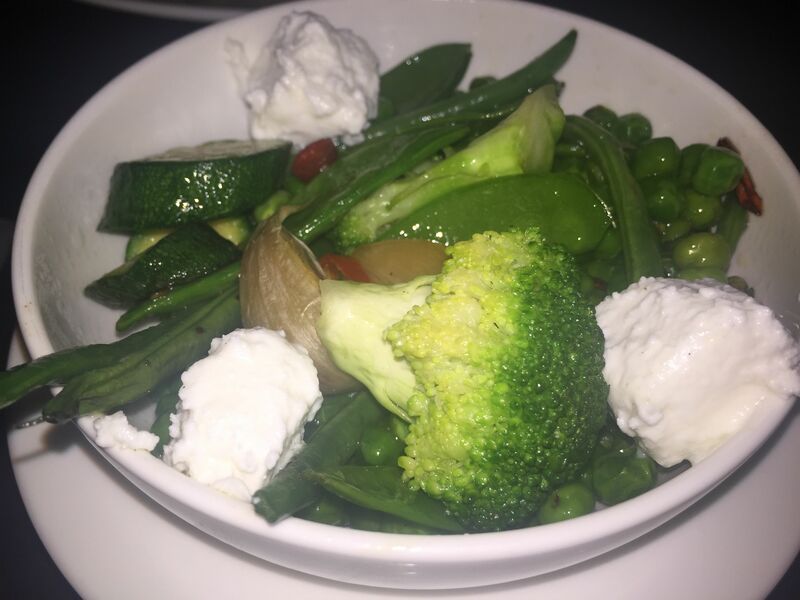 We were convinced to order a vegetable dish, well, lets face it we convinced ourselves as the pan-fried green vegetables with feta, chilli and confit garlic sounded too good to resist. A vegetable dish to dream of – and that confit garlic – heavenly. Overall, this is one of the nicest dining experiences I’ve had in a long time. Despite being in a top-quality, five-star, exclusive hotel there wasn’t a trace of snobbishness or pretention. The service was simply amazing, friendly, helpful and everyone seemed to go the extra yard without any hesitation. You’re getting the best of everything with a totally relaxed vibe. A rare and beautiful combination. The restaurant is spacious with high ceilings and we had a fabulous table with plenty of room around us. I simply love that, a whole load of personal space to be enjoyed. On top of that it was truly great value. The substantial wine list had a good selection of vino on the reasonable side price-wise, as well as an amazing selection of South Africa’s top end offerings, and the food was well-priced, too. Thank you One & Only and Reubens for a great celebratory night out. And I hadn’t even mentioned the birthday…can’t imagine anyone could have made any more effort if I had. I’m thinking this may be the first visit of many. Reuben’s is in the One & Only Hotel along the Victoria and Alfred Waterfront in Cape Town.